Pay per click advertising has revolutionized the way we think about advertising: especially on the internet. An advertiser is now able to create a campaign in five minutes directing targeted traffic to a campaign. As much as this sounds all well and good, it does not guarantee you complete success in PPC. Before you even press the ‘all go’ button for your campaign, it is strongly recommended you undertake a S.W.O.T. analysis of your campaign. This will help you identify whether you will make any money from your campaign or not. Strengths – What are the strengths of the product/service you are trying to promote? Weaknesses – Does your product/service or even the way you are promoting the product/service (being your PPC campaign) have any weaknesses that will put you at a disadvantage? 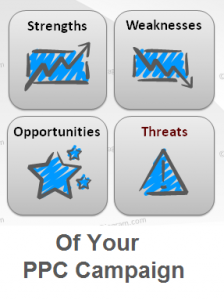 Opportunities – Is the market you are targeting a niche market? What opportunities does your product/service offer to you? Threats – Are there competitors out there in the same market that have a products/services similar to yours? Are there PPC advertisers that are getting into PPC bidding wars with you for the same keywords? Are they a threat? A SWOT analysis of your PPC campaign will help you identify where the main flaws are with what you are trying to promote. You may have created a magnificent campaign. However, without the right business strategy, it will be all for nothing. A SWOT analysis’ objective is to merely make aware of (mainly) the weaknesses and threats of whatever you are performing a SWOT analysis of. After reading this, there will be some advertisers that will feel that performing on a SWOT analysis of their campaign will take a long time an is not worthwhile. However, it can literally take just ten minutes of your time. Using the your own knowledge and the internet, you will be able to find the strengths, weaknesses, opportunities and threats to the business side of your PPC campaign. It’s strengths – For example, if it has a high conversion rate, you may be able to afford to spend less on CPC to increase financial efficiency. It’s weaknesses – This should be your priority to improve. No matter what weakness your PPC campaign has, you will find the answer to improving it here on PPC.org. It’s opportunities – Is the campaign performing so well that you could potentially run another campaign alongside it? What opportunities does your campaign potential have? It’s threats – It is important to monitor the threats of your campaign to ensure your campaign does not dwindle out to nothing. By finding the main threats to your business model and campaign early can help you reduce the chances of the threats impacting your campaign through creating a contingency plan to prepare for the worst (and possible best) scenarios.